Referencing both Charcot's late 19th century photographs of female 'hysterics', the Medieval moral phantasmagoria of Bruegel & Bosch and the work of Cindy Sherman, ' A Hysterical Woman' employs dark fantasy and sinister humour to offer frozen moments of a mysterious transformation. 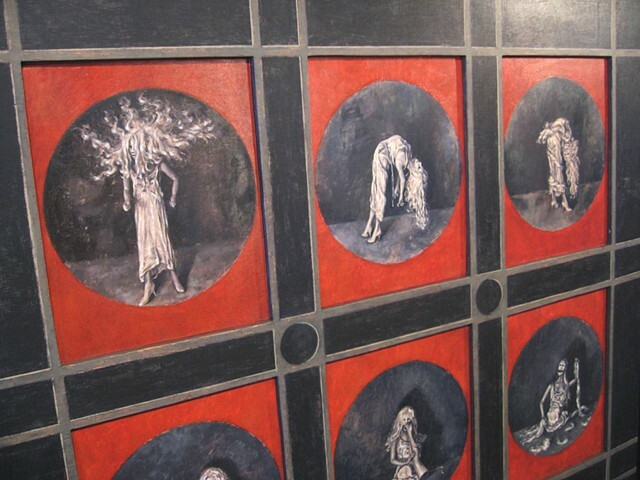 The work was made as an attempt to chart and manifest the artists' own intimate experience of severe depression. This piece is a complex wooden construction made up of 9 individual panels recessed within one larger painted panel, with frames cut out of its surface, in order to create the impression of 9 windows, or 'cells'.